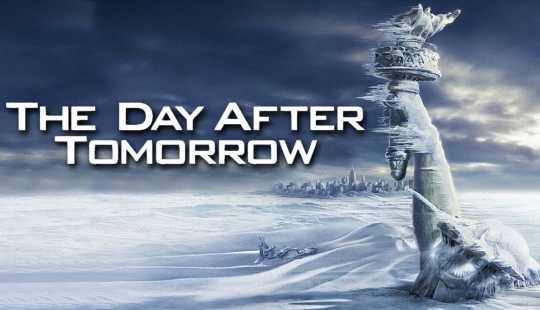 The Day After Tomorrow was a 2004 film co-written, directed, and produced by Roland Emmerich. It depicted the destruction of a good fraction of the United States by a terrible weather calamity that had been brought about by global warming. While it was widely recognized as being scientifically inaccurate, it supposedly had a scientific premise. The idea was that global warming had caused so much polar ice to melt that it interrupted the North Atlantic current that transports heat around the world. As a result, outbreaks of violent weather occurred, causing terrible destruction. The media discussed the film a lot back then, and even Al Gore said that while it was fiction, it was a good starting point for a debate about climate change. While no scientist would ever suggest that such a thing could happen as depicted in the movie (the timescale was way too short, for example), a study was published last year that suggested global warming has started disrupting ocean currents.1 In particular, the paper suggested that the Atlantic Meridional Overturning Circulation (AMOC) was slowing down. Since the AMOC is a “conveyor belt” of currents that move heat around the globe, the study got the media once again talking about the 2004 film. Not surprisingly, a study that suggested something “unprecedented” received quite a bit of media attention. Equally unsurprising, a recent paper demonstrates that actual measurements of the AMOC indicate that there is no evidence for any kind of weakness. …there is no undoubtable evidence of a weakening or strengthening of the AMOC, as no index returns an accurate measure of the AMOC strength over a time window long enough to clear the longer term trend of the multi-decadal variability. The most likely pattern is oscillatory about a longer term trend not sufficiently well delineated. In other words, direct observations show that the AMOC is probably pretty stable. There are short-term fluctuations, but they even out over the long term. If there is a long-term slowing down (or speeding up) of the AMOC, it is not detectable with the data we currently have. So while computer models suggest that there has been an “unprecedented” slowing of the AMOC, the data do not show anything of the sort. This is just another example of the dramatic disagreement that exists between climate models and the observations they are trying to predict. Until this dramatic disagreement comes to an end, it is sheer folly to use climate models as a basis on which to make conclusions about climate change. Regarding ice ages, I was in a class my pastor, a lay geologist, was teaching on the Flood of Noah, and he mentioned scientists have no plausible explanation for how ice ages could have formed and computer simulations have failed to produce an ice age with the assumed parameters. The only model that can explain an ice age is a global flood, where the oceans would be warm from ocean floor turn over and the continents cooled from the albedo effect of volcanic ash. Is he correct that the ice age formation is a mystery to modern science? Does the Flood have a plausible explanation for ice age formation, which he states lasted for about 700 years? I wouldn’t say that old-earth scientists have “no plausible explanation for how ice ages could have formed.” There are some plausible ideas, but they have not been fully worked out. In addition, there is some research that contradicts those plausible ideas. I do agree that the young-earth creationists have a better explanation for how the ice age started, but I don’t think it’s fair to say that the old-earthers don’t have a plausible explanation. My experience with climate change or global warming or whatever you want to call it is personal, my own observations going back over 50 years. Summers have gotten longer and warmer. Winters shorter and warmer. Maybe it’s just a glitch in the weather, and maybe not, but it behooves us to do what we can to get away from using oil and NG to power our world. At the very least, no longer would we need to keep a large contingent of Pentagon resources in the ME, where they now seem to be stuck in a series of endless wars that is not making the USA safer, just the opposite. Keep speaking reality. You’ve heard it said that Rush Limbaugh is the mayor or Realville? Well, I say you are Realville’s Scientist In Chief! Computer models (though of some use) need to be carefully vetted before being considered reliable. The vetting should not be done by those who have created the models as they (the designers) mostly are not able to see the various programming mistakes that they have made (in fact over my career, I’ve not actually found any who have got it right and these are experts in their respective fields). Many times these models make assumptions that are incorrect or have coding that that ensures that the wrong models assumptions are applied. From a personal perspective, the models (as they exist now) do not take into consideration the required energy flows needed to get the outcomes reported. In a discussion that came up, one objection to these models argued that the energy required for the expected changes was not being accounted for. The response to this particular argument was to point to a study that showed that sufficient energy had been retained in the environment over a period of 50 to75 years. On further investigation into the details of that study, while the required energy had been retained in the environment, it was widely distributed and only about 5% had been placed into the specific environment control. In effect, for the results being discussed, it would take at least another 1000 years before enough energy had been input. This dis not take into any account of energy removal or other energy flows. The interpretation of such a study will be up to the beholder. Both participants got different things from it. At any rate, any computer model created needs to be closely vetted for both logic errors and numerical mathematics errors. The latter can cause problematic anomalies even when logically correct. this is due to the simple fact that numbers are of a finite size in all computers and special care must be taken when doing these calculation to not lose relevant information.